With the many depression medications available to treat mild to severe cases of depression, worrying about which medication to take may only heighten your anxiety. Depression treatment can come in many forms, and identifying the best option for you can be both confusing and time-consuming. We will look at the pros and cons of depression antidepressants, as well as other health concerns to consider. Antidepressant medication is commonly used to treat various depressive disorders. Depression is a medical condition represented by a low mood with emotional, physical, cognitive, and behavioral symptoms. It may be caused by a combination of factors, such as stress, genetics, and a chemical imbalance within the brain. 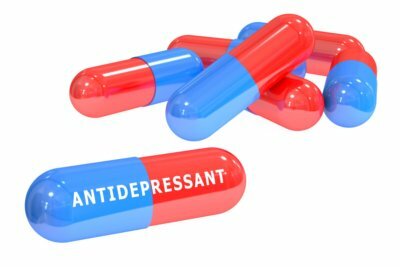 Antidepressants focus on balancing the chemicals that form our emotions and mood by promoting concentration, better mood, sleep, and appetite, all of which can be negatively affected by a depressed state. Selective serotonin reuptake inhibitors (SSRIs) are common antidepressants prescribed for moderate and severe cases. These are considered to be safer than other prescribed depression drugs and have fewer side effects. Each one of these drugs has their own individual potency for depression with varying successes. These SSRIs are commonly interchanged to find the right combination treatment for the patient. The drugs are also used to treat anxiety disorders, sleep disorders, migraines, chronic pain, eating disorders and addiction diseases. Antidepressants are mainly used to treat the symptoms and the underlying cause of the depression diagnosis. Daily intake of the medication may be required for months or possibly years for many patients. The medication may be used in conjunction with other treatments such as therapy, support groups, acupuncture, and relaxation techniques. Lifestyle changes such as regular exercise, nutrition, and sleep may also help with depression symptoms. Depression medications may all have similar goals, but they also have varying effects, based on the individual patient. The side effects of antidepressants can range from mild to severe and differ from medication to medication. As with all prescribed and over-the-counter medications, antidepressants have pros and cons. The following benefits and side effects have been observed in patients taking antidepressants. Can cause issues such as premature delivery in developing fetuses. With antidepressants, the side effect of suicidal thoughts may be a real possibility. A study published in the British Medical Journal found that commonly used antidepressants increased the risk of suicide twofold in participants under the age of 18 years. The University College London examined this review of more than 70 clinical trials studied by the Nordic Cochrane Centre. The end results suggest that, while there was no link shown between the use of antidepressants in adults and suicide, there may have been misrepresentation within the trials themselves. The authors of the study warn the documented differentials between the trials and the patient reports may misrepresent the potential harm of using antidepressants. While there have been many studies and clinical trials with similar results, there have also been studies showing no direct connection between antidepressant use and suicide. A study presented at the 2017 Anxiety and Depression Association of America Conference suggests the rise in suicide risk among teens treated with depression may be attributed to the disease itself and not the antidepressant. The study emphasized findings based on several studies of suicide risks before, during, and after use of SSRIs. These studies were funded by the National Institutes of Health. The collection of data suggests suicide attempts were present before use of these antidepressants, which lead to the use. It further suggests that the use of SSRIs, by participants of the studies, resulted in a lower rate of suicidal attempts and suicides. Each antidepressant under scrutiny for risk of aggressive and suicidal behaviors has a “black box warning.” This Food and Drug Administration label intends to make patients, pharmacists, and doctors fully aware of the possible dangers of the drug. The warning is the highest level a medication can receive without being pulled off the shelves completely. A depression diagnosis covers a wide array of symptoms and requires a combination of treatment vices. Antidepressants may be the first, and sometimes only, choice of many physicians in treating the symptoms. There are many types of antidepressants, each one with its own strength to target the chemical imbalance within a patient. Each one may also offer mild or severe side effects that can affect individuals differently. What drug works for you may not work for another. As with any medication, there are pros and cons of antidepressants. Working with your team of medical professionals can help determine if the pros outweigh the risks for you. Calderone, J., “The Rise of All-Purpose Antidepressants,” Scientific American, November 1, 2014; https://www.scientificamerican.com/article/the-rise-of-all-purpose-antidepressants/, last accessed November 7, 2017. “10 Surprising Antidepressant Facts,” Health; October 29, 2017; http://www.health.com/depression/10-surprising-antidepressant-facts#all-antidepressants-are-equally-effective, last accessed November 7, 2017. Ristovski, M., “Pros & Cons to Consider Before Taking Antidepressants,” Her Campus, October 10, 2016; https://www.hercampus.com/school/uwindsor/pros-cons-consider-taking-antidepressants, last accessed November 7, 2017. Stritch, S., “Pros & Cons for Medicating Depression,” Livestrong, August 14, 2017; https://www.livestrong.com/article/31216-pros-cons-medicating-depression/, last accessed November 7, 2017. “What are the real risks of antidepressants?” Harvard Health Publishing Harvard Medical School, March 2014; https://www.health.harvard.edu/newsletter_article/what-are-the-real-risks-of-antidepressants, last accessed November 7, 2017. “What are SSRIs?” WebMD; https://www.webmd.com/depression/ssris-myths-and-facts-about-antidepressants#2-4, last accessed November 7, 2017. Knapton, S., “Antidepressants can raise the risk of suicide, biggest ever review finds,” UK Telegraph, January 27, 2016; http://www.telegraph.co.uk/science/2016/03/14/antidepressants-can-raise-the-risk-of-suicide-biggest-ever-revie/, last accessed November 7, 2017. Melville, N., “Antidepressants in Youths: No Link To Suicidal Behavior?”,Medscape, April 20, 2017; https://www.medscape.com/viewarticle/878895#vp_1, last accessed November 7, 2017.